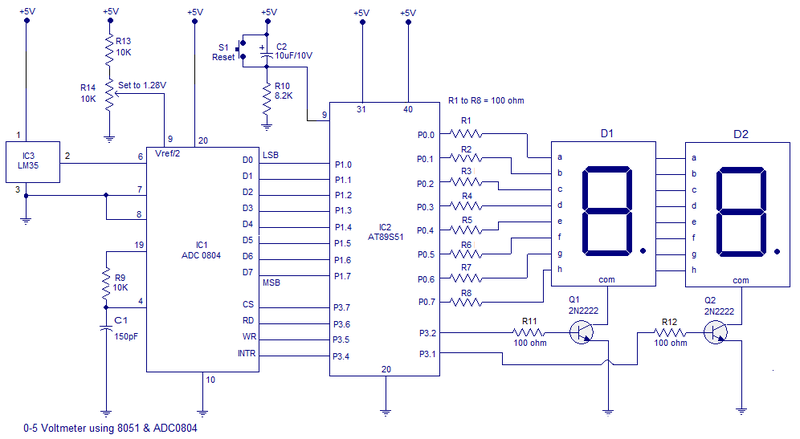 This article is about a simple 0-100°C digital thermometer with 1°C resolution using 8051. The circuit is based on LM35 analog temperature sensor, ADC0804 and AT89S51 microcontroller. LM35 is an analogue temperature sensor IC which can measure a temperature range of -55 to 150°C. Its output voltage varies 10mV per °C change in temperature. For example, if the temperature is 32°C, the output voltage will be 32 x 10mV = 320mV. ADC 0804 is used to convert the analogue output voltage of the LM35 to a proportional 8 bit digital value suitable for the microcontroller. The microcontroller accepts the output of ADC, performs necessary manipulations on it and displays it numerically on a 2 digit seven segment LED display. Out put of the LM35 is connected to the +Vin (pin 6) of the ADC0804. Resistor R13 and preset R14 is used to provide an external reference voltage of 1.28V to the Vref/2 pin ( pin 9) of the ADC0804 and with this reference voltage, the step size of the ADC will be 10mV and span will be 0-1 V. This means that for a 10mV input the digital out of ADC will be 1 (1 in decimal also), for 20mV it will be 10 (2 in decimal), for 30mV it will be 11 (3 in decimal) and so on. The microcontroller accepts this data and puts it on the seven segment display.